After you blog for a while, what you blog about either ceases to be relevant or ceases to provide new and entertaining material. Or perhaps inspiration. In any case, Taiwan Tiger has, as of late, been lax in posting. New and busier times--a marriage, expanding workload, graduate school--have really made things difficult. There is also the material. I started this blog to keep my friends and family updated on my life in Taiwan, and as a way to describe the new and strange things I saw and situations I found myself in. This was 5 and a half years ago. So much of what I have described here is no longer new to me. I have decided that it is time for a change. One of my (numerous) character flaws is taking things too seriously. Without going into detail, let's just say: I get angry easily. No, I have no rage management issues, nothing like that. I just could be happier and enjoy life more by focusing on more positive things. I know one of the things I found necessary when I moved here was to develop a sense of Teflon. Everything just slides off. That little old lady at the bank with her elbow in my ribs as she pushes to the window for a stamp? Let it go, Tiger. That blue truck driving the wrong way during rush hour, forcing me to swerve or become a hood ornament? Serenity now, Tiger! So that is what I propose. Recently, I have been working with my classes on humor and culture, so I have been reading funny things and looking at funny comics and pictures. Laughing, as we all know, feels good. This project I hereby embark upon is to attempt to write in a more humorous vein, focusing not on my own frustration but learning (or forcing myself) to recast situations in a lighter essence. I don't know how long it will take to retrain my self to see things differently, but life is too short not to smile more. Sorry, no funny punchline ending. I got up at 6:30 Sunday morning to take a train to my E-commerce course. Nothing funny to see here, folks. Keep moving. I remember a long time ago, I found this website where you could type in something in your computer, and it would show it across a scrolling LED board sitting in someone's window in Germany--and projected via webcam onto the screen. I ended up having a strange "conversation" with someone who was a Cleveland Browns fan by taking turns projecting our half of the conversation on the LED board. Quite strange. Being a Broncos fan, I've always had a healthy respect for the Browns, and it was a crime what A.M. pulled on the citizens of Cleveland in the name of a dollar. Terrible. Now the same **** is being pulled on Seattlites. My heart is aching now for the possible--or probable--departure of the Sonics from Seattle. Briefly, the owner Howard Schultz, sells to a rich oil tycoon Clay Bennett who professes to the desire to keep the Sonics in Seattle. Then asks the city to pony up a new $500 million stadium in far away Renton in order to keep them there. Nevermind Key Arena has been recently renovated. The City of Seattle rightly says NO, that's way too much. Then we find out that Bennett all the time had been planning to move the Sonics to his hometown of Oklahoma City, so made an offer that was impossible to fulfill. So where is the NBA commissioner to step in and right the ship? Oh, he's David Stern, a close friend of Bennett, who has expressed no interest in keeping a 40-year franchise in Seattle, pretty much actively trying to destroy the franchise. Oh, and new developments: OK City approves a bill to expand their Ford Center in order to "lure in" an NBA team--to the tune of $112 million. So OK City's $112 million proves their desire for a team, when Seattle's bill was $500 million? Please, if you support this, DO something! On the second of the ESPN articles, there is a suggestion of a way to draw attention to this. Let's do it. I'm there in spirit! 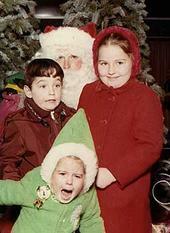 This is by far one of the funniest Christmas photographs I have ever seen. I saved it so long ago, I don't remember where it is from. If I stole it from your website, I'm sorry. If this was your family Christmas, I'm really sorry. You know the "rubbernecker" syndrome? Where something you see is so bad, that you gotta just stare at it a get a good view of the wreck. Well, there's a situation going on in Kaohsiung that fits that bill. Something that I just have to watch as it trundles to a horrible crunching mess. It's a new restaurant called The Villa. Close to where I used to live about 2 years ago, there was a no name noodle shop that I ate at once. Only once. Now, I've eaten at over 100 noodles shops here in Taiwan, and most have been good to excellent. It's hard to mess up noodles. But this noodle shop? Wow. We got the noodles and walked home to have them for dinner, and opened up the box. Slimy, overcooked, and tasting only of...well, oil. They were so awful we couldn't eat them. Fiona's comment was "好利害! hao lihai" which is normally used for something "awesome, amazing, formidable" in a good sense. I looked at her quizzically, and she explained that the shop was so amazing because they could screw up something that was practically un-screw-up-able. So it is with the same amusement that I came across General Pancho's, and now The Villa, a foreigner-owned place that could claim "好利害! hao lihai" status. It's not out of spite that I do this. I just think it is amazing how captivated I am at this place. Maybe it's schadenfreude or 幸災樂禍 (xing4 zai1 le4 huo4), but occasionally, I am just intrigued by ineptitude. The Villa, which I think is owned by a Canadian, opened up as an offshoot of a Mexican roadside stand called General Pancho's. Now, let me say that I would love to have a(nother) good Mexican restaurant in town. Teresa's (South American, actually) has some delicious stuff down in Yen Chung district, and Smokey Joe's provides some decent "tex-mex" cuisine, though I have never been a huge fan. So the promises of The Villa sounded good. Opening reports were rough--friends reported waiting 45 minutes for a drink, and 15 minutes for someone to open a bottle of beer (eventually just getting their own), despite the staff's standing around doing nothing. I believe the words "incompetent" were used by a fellow barstaffer in description of the service. Now, any restaurant that doesn't do a soft opening for some friends (as presumably they didn't) is going to run into some problems, so it's a little understandable. Another report comes my way--they ran out of ice for the cocktail that the customer watied 15 minutes for, no salsa in the burrito, terrible taste. Nacho chips made from ..deep fried white bread. Yes, that's no typo. OK. Well, I'll try it and see. Now, the first time I went to the General Pancho's to try it out I got a real surprise. How do you screw up tacos? Here's how: take a nice, crunchy pre-baked corn tortilla shell, and d e e p f r y it until it is the thickness, texture, and taste of a paper plate. Add toppings, omitting salsa, (which can be added for an extra NT$30!). We ended up removing the contents from the shells, which were dripping oil onto the plates. Now, I don't know how they make tacos in your neck of the woods (is this a tradition somewhere?) but when they delivered the deep fried shells, my reaction was "what the f*%$ is that?" My second "what the f*%$ is that?" occurred when I went to The Villa last night. I perused the fairly extensive salad list, as I was really wanting a good salad. House salad, chef's salad, shrimp & something salad, Ceasar salad, Greek salad, prosciutto and gouda salad... looks pretty good. I ordered a Greek salad and a margarita. My margarita (timely delivered!) had only the small problem of being made of orange juice and garnished with a lemon. But the Greek salad was what did it. As promised, the cucumbers, olives, feta, onions, and green peppers were all there. In a 2 centimeter pile on a plate. With no lettuce. Uh, a Greek salad? "What the f*%$ is that?" I explained my understanding to the waitress that salads as those listed have lettuce by default. [imagine for comparison a "bread lover's hamburger"--all bun with nothing in between...] I was not offered any choice except to order an additional house salad (costing extra of course) to add some lettuce to the "salad". I folded, and said okay. She comes back later to report that they are out of lettuce. Out of lettuce? It's a Mexican restaurant that advertises lettuce in fully half their items, not to mention the salads and the hamburgers that require lettuce. Not to mention that there is a big grocery store 2 minutes away that is open and has tons of lettuce! My thought here is really that they probably just figured that they could serve a Greek salad without lettuce, hoping I wouldn't notice. At this point, I realized that earlier reports were not unjustified. The owners appear to be really clueless. Anyway, I changed to a beef burrito, knowing of course that the burrito, which was advertised to include "rice, refried beans, lettuce, southwestern sauce, and salsa" would not have lettuce. What I didn't count on was the omission of the refried beans and salsa as well. Now, I want to stress that I don't know where all this is coming from. Is the owner a foreigner with a peculiar sense of taste and humor? Is it being reinterpreted in the kitchen by a Taiwanese cook who has no idea what this cuisine is supposed to be? I don't know, but The Villa's ability to screw things up is nevertheless uncanny. So now I want to go again. Why? I realize that they are just "好利害! hao lihai"--so talented as to be able to screw up something that I previously thought was un-screw-up-able. So I am dying to order something else and see what shows up, to see what clueless creative "take" on a standard will arrive at the table and prompt me to say "what the f*%$ is that?" I think I had better go soon, though, as I don't think it will be around for long. I was recently quite excited to find a link to listen to internet radio from, of all wonderful and remote places, the Federated States of Micronesia. Specifically, the island of Yap. Considering that my grandfather was stationed on Ulithi in the Caroline Islands during WWII, this bode well. I was full of promise that I would be entering a world of local radio. I remembered my college days in Vermont, when the local NPR station would read a list of who had "got their deer for the season." Literally, "James Marshall, 8 point buck near Pittsville" or something like that. So, you can imagine my excitement--what would Yap offer? "Jimmy Nutuu has lost his pig. It's brown with black spots. If you see it, could you bring it back over to Jimmy's house?" Eagerly I tuned in, and what is the first song I hear? Can you believe it? Hotel California. Yes, freakin' Hotel California. The same song that has been driving everyone nuts since 1980. The song that will not die. I was so disappointed. I'm going outside. 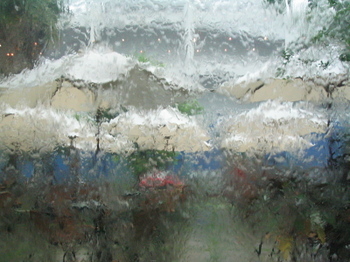 6/6: Intermittent Heavy Rain...or so it seems. It seems like it's been raining for a few weeks now. I'm not sure I even remember the last completely sunny day. Monsoons are here again, which means wet and sometimes thankfully cool weather. Otherwise known by me as "good sleeping weather." Soon, with the completion of school, I may be able to capitalize on it. For now, I must ponder the question: Does staring out the window at the rain count as work? Last weekend, we made a trip up to Chia Yi and Alishan. F. and I took the train up on Saturday morning and met up with the rest of her family, who drove up that morning. The first thing we did was head out through the rain to the big Matsu temple (built in 1694) in Yun Lin. Since there were so many people, we parked about 1/2 mile away, and walked across a bridge to get to the road that brings you to the temple Being Matsu’s birthday (29 again? 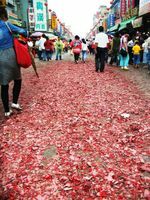 ), there were many groups of celebrants on that road, too. We had a conversation about whether these groups were essentially religious or cultural. Our end decision, like often happens in Taiwan, is that it is a bit of both. Basically, your township may have a Matsu temple. If so, you should go to the nearest really BIG Matsu temple (where all the gods gather on that day) and gather some good luck for your village by marching in a procession or parade (there were even a few marching bands) to the temple, where you perform outside, blow off a enormous string of fireworks, and then go in to join the THRONG of people inside. Literally, pushing room only. It was amazing. Gongs, bells, cymbals, chants, suonas (that shrill trumpet thing)—it really is 好熱鬧 (re4 nao4)! If you have a chance, do it. One of the most interesting things I have seen inTaiwan in 3+ years. After that wonderful and exhausting ordeal, we went to a friend’s restaurant for smoked chicken and various other dishes. It was in a way a test weekend for F.’s sister’s boyfriend A-Shang, who wants to build some trust with the parents. Basically, he wants earn some points, if you know what I mean. He was very nervous about the timing, so we tried to help him out the best we could. This was his friend’s restaurant, so he wanted to treat us. Next, we went into Chia Yi and checked out a new building, the Ri __ Tower (called the Chiayi Tower in English). It is about 12 stories high, and the artwork is dedicated to the old Taiwanese (I think it is aboriginal, but everyone seems to know it here…) story about when there used to be 9 suns in the sky and all the crops were burning and people dying, so some guy went to shoot a few of the suns from the sky. The tower is relatively uninteresting, but offers a nice view of Chia Yi, as well as one of the more frightening views in Taiwan. The center of the tower is open, so when you go to the 11th floor, you can stand on the glass panels in the floor and stare straight down some 11 floors. It’s unnerving to say the least. I took a picture, but it really isn’t worth putting up here, as it isn’t all that clear. We spent the night in a SPA motel (in Taiwanese, “mo-tay-oh”), and I soaked in their full-size hot spring-fed tub. Aaaah. 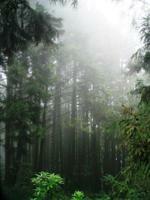 On Sunday, we went in search of King Wasabi in the forests of Alishan. Alishan can be a fun place, but I certainly recommend going on the weekdays. The weekends, especially in nice summer weather, finds many tour buses climbing the mountain road up to Alishan. Once you are there, the beautiful tall cedar forests are filled with the sounds of Taiwanese and Mainland Chinese tourists yelling to each other to the forest, oblivious to the other walkers who may prefer a quieter experience. I don’t know why—education that didn’t emphasize the joyful experience of solitude, or maybe most have just never been in the forest before. At any rate, winter is usually not too busy even on the weekends, but weekdays are a must other times of the year. We walked through lots of beautiful scenery and tall trees and had a grand old time. I bought some山粉圓 to put in drinks, and ate some wasabi. But the elusive King Wasabi was not to be found. We found some of his little minions lying about. Sometimes I thought I saw shadows lurking in the woods, and smelled a pungent odor, but it wasn’t until we exited the woods near a temple that I found the great King Wasabi. Majestic, standing a full 8 feet tall, radiating his tongue-tickling glow. Made entirely of plastic. Ok, so it is just a big touristy thing like all the giant Mister Chef restaurants and like in Pocahontas, Iowa. After exchanging ceremonial gifts, we headed back down to Fen Chi Hu for dinner, then back down to Chia Yi to catch the train back to Kaohsiung. . I've added a photo album of the whole experience! The Nokia is Dead! Long live Ming! Nah, it didn't last. The Nokia kept sputtering and not responding, and I need to count on it, so I replaced it with a nifty little phone/PDA with a Chinese-English dictionary (which so far seems to be much better than the Nokia's, which had tons of chemical names added as filler, but lacking some standard usage words. Some were just plain wrong, too.). 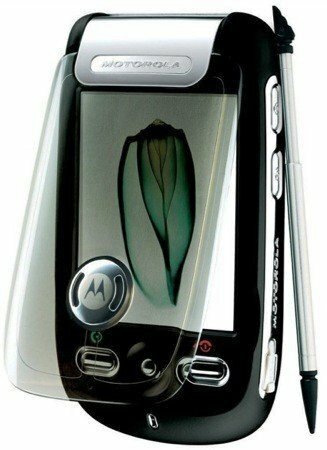 Plus, with the Motorola Ming, you can write in Chinese, either handwritten or with Zhuyin or Pinyin input. Handy. Now don't drop it, Tiger. I'm working on a few new albums which detail some recent traveling adventures. I hope they will be ready soon! The Nokia is Dead! Long Live the Nokia! It's said that bad stuff travels in threes. Technology is not being cooperative as of late. 1. The death of my Apple iBook in the fall. 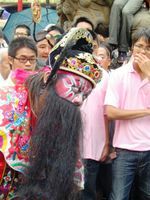 (cost to replace: NT$50000. Haven't done it yet.). 2. My scooter began bleeding oil, and is on its last throes. (cost for new replacement: $NT55000, used, about NT$20000). I put in a new engine and will wait until I find another used one in good condition. 3. Last night, I dropped my cell phone as I was putting something in my scooter, rendering my cell phone screen useless. It is also sounding tired, with the ring tone sounding utterly pathetic. Sigh. The Nokia is dead! But then, suddenly, this afternoon, it popped back to life! Apparently, it just got its bell rung. Long live the Nokia!